Over the past year, the handling of personal property and redemption fees has become one of the hottest compliance topics in the industry. It is on the radar screen of virtually every auto lender in the country, as well as the regulators. Most of this interest is sparked by CFPB concerns over disparate treatment of customers and inconsistencies in what customers are charged. Most major lenders have moved away from this approach primarily because lenders have little control or visibility on what is actually being charged. Consumers face the same dilemma and can be taken advantage of by agents. It’s no surprise that the lending community is migrating away from this model. Although some states do regulate and specify vehicle repossession related fees, this approach still leaves the lender exposed to wide variations in fees charged. This structure does provide more visibility but there are inconsistencies on what is charged to different customers and by different agents. When it comes to personal property and redemption fees, this is one of the better models as it reduces disparate treatment and ensures reasonableness. The lender sets allowable charges which establishes a guideline for the agent. While a more favorable approach, the lender continues to lack visibility since there’s no guarantee that an agent will comply. When lenders set allowable charges and it’s also billed to the lender, there is both visibility and accountability. More and more lenders are migrating to this approach. All in One pricing is a single flat fee set by the lender that covers the cost of the repossession, any personal property or redemption-related fees, and other ancillary services that might occur. This model is extremely straight forward and very easy for lenders to administer. It’s a one size fits all approach; however, therein lies the challenge. Only a percentage of repossessions involve personal property, redemption and storage. This makes it difficult to come up with an appropriate price that would make sense for every repossession. Maximum of 50 unless state law provides specific guidelines in which case state law would apply. We feel that this framework strikes the right balance between a fee schedule that is reasonable for the agent, the need to be fair to the consumer and the need for a process that the lender can defend from a compliance standpoint. 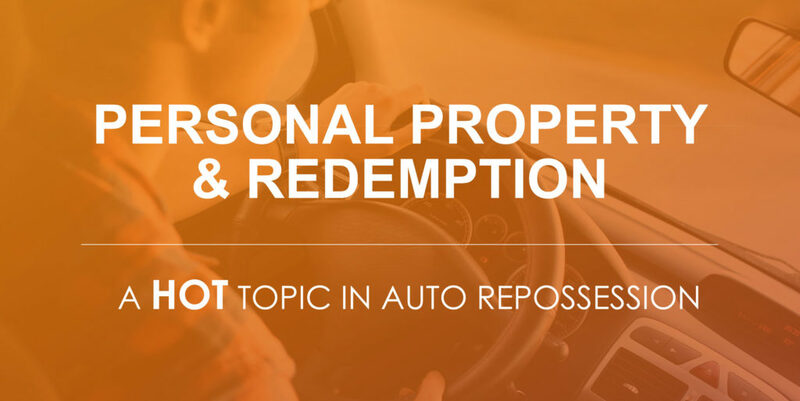 Get a PDF copy of our article “Personal Property & Redemption Fees: A HOT Topic in Auto Repossession” to read later or share among your coworkers and colleagues. Should you have any questions, contact our team.